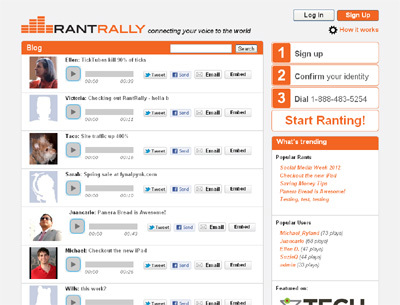 RantRally is a social site where users can share with others through the power of their voice. Call a toll free number, leave a message, and your ‘Rant’ attaches to your profile and is available for anyone to hear. Your listeners know that it’s you, and when they hear your voice they feel an emotional connection that could never exist with text alone. Call, connect, share. The web should be more than just text.